A more complete lineup was the elixir this weekend for the Picton Pirates as the PJHL squad broke a two game losing streak and took the full compliment of points available to them. On Thursday, despite a Herculean effort by county native Alex Ward in the Campbellford Rebels net, the Pirates were able to get past the visitors by a count of 5-1. On Saturday, Picton shook off a slow start and topped the visiting Port Perry Mojacks 5-2. With the victories, the second-place Pirates closed the first half of their 44-game schedule on a winning note and improved their record to 14-7-1 and have a seven point lead over the Amherstview Jets who visit Picton on Thursday evening. For Picton Pirates assistant coach Dave Pratt, the weekend was a welcome outcome as the club welcomed back a few of its wounded players into the lineup. Picton had been bit by the injury bug rather hard in November and while the team is still lacking the services of Scoley Dow, Owen Dever and Riley Manion, tide seems to have turned somewhat and the Pirates were able to ice a full contingent of players this weekend. There was certainly some need for leadership after the first period of Saturday’s game against the MoJacks, an organization making its first trip to Picton since the 2011 Schmalz Cup semifinal when the Pirates eliminated the Orr division squad in five games. Picton found itself tied 1-1 after one but the Mojacks had the puck for most of the first period. Griffen Conger’s unassisted effort at 15:21 gave Picton an unlikely lead but a late Port Perry goal off the stick of Owen Hurtibese with just 12 seconds left left the contest at 1-1 after one. That the visitors out shot Picton 16-10 in the frame was certainly an indication that the locals needed a more determined effort in the second stanza. Pratt, who was filling in for head coach Tyler Green who was away from the club on Saturday, said the club had a good chat during the first intermission about what was at stake. County native Justin Arnold would set up Matt Poole at the 7:41 mark of the second to put Picton ahead 2-1. Just over seven minutes later, Arnold would collect a nifty Cooper Rogers set up and extend the Pirates lead to 3-1 and leave the club with a two goal cushion through 40 minutes. After outshooting the Mojacks 18-12 in the second, Picton continued to pull away in the third. Pratt praised the efforts of Landon McLellan and Will Harrison and those combined for Picton’s fourth of the night at 12:52 as the Picton native made a great pass to set up Shannonville’s McLellan. Hurtibese would get the Mojacks back in it with an unassisted powerplay goal at 15:58 but just 61 seconds later, it was Matt Poole setting up Logan White just inside the circle for for Picton’s fifth of the contest test. The game was hardly over however as Shaw Boomhower and Port Perry netminder Corey Kuypers became embroiled in a scuffle on the ice towards the end of the contest. 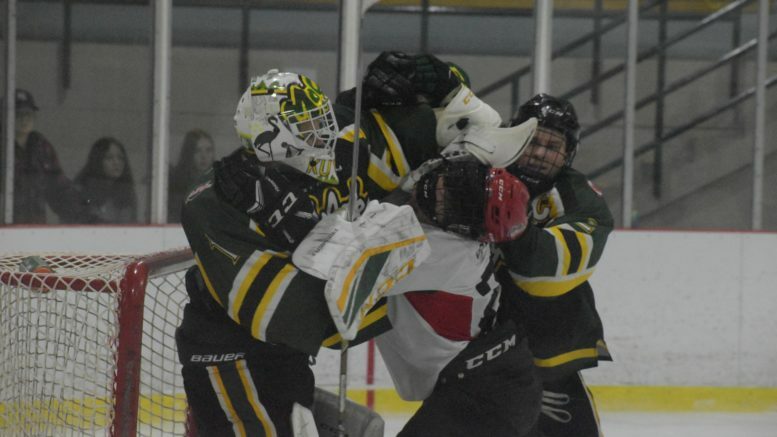 Moments later, a fist fight involving a Picton fan and a suspended Port Perry player broke out in the stands, leading to some tense moments before cooler heads intervened and separated the parties. On Thursday, Picton needed to be a little desperate in their contest against the last place Rebels after losing back-to-back games the previous weekend. Alex Ward was sensational in keeping his club in the contest for as long as he could. Picton would outshoot the Rebels 18-5 in the first but it took until the final minute of play before the Pirates finally bested the Prince Edward County Minor Hockey Association alum. White’s blast with just 46 seconds left in the opening stanza set Picton up for a 1-0 lead heading into intermission. In the second, a pair of Conger goals put Picton ahead 3-0 and gave the Pirates some sense of security that the Rebels weren’t about to engineer an upset and bag their second win of the season. Andrew Ward, brother to the busy netminder, would set up Cambellford’s only marker in the game on a pass to Andrew Moran at 16:34 to get the Rebels on the board at 3-1. In the third, Picton’s McLellan and Noah Brant would score to make it a 5-1 final. Picton starter Brock Prescott made his first start in a Pirates net and stopped 15 of 15 Campbellford volleys. In a losing effort, a valiant Alex Ward stopped 50 shots and made the result somewhat more humane than it probably should have been. The Pirates host the Jets in an important four point matchup at home on Thursday and then play the Tod division leading Raiders in Napanee on Friday. 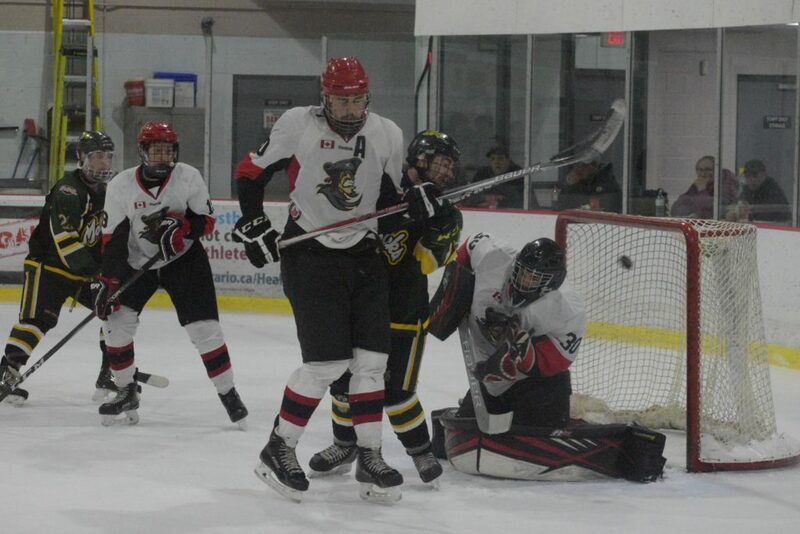 The Pirates wrap up the weekend with a trip to Sutton on Sunday to tangle with the Georgina Ice.